Creation of multi-use resort buildings providing 64 residential apartments, cafe/restaurant and village shop and provision of 73 parking spaces. Provision of new access and other associated works. Link to the decision notice. conservation and heritage should be covered by an assessment. The proposal represents a considerable increase in the size of development from the approved 'Liner' building. There is a 40% increase in floor area, the footprint on the site is almost doubled, and the easterly building has increased in height by another storey. The proposal is thus a significant over-development. The three buildings are designed in such a way as to create considerable and negative wind tunnel effects. The apartments are too close together which could, as they appear to be mostly glass walls, give rise to fire safety issues. Also there is very limited view from and light into the rear apartments, and the Civic Society questioned whether anyone would wish to buy them. The Civic Society sees little difference in principle to this proposal and that for 35 apartments on the land at Middle Point on Pendennis headland. The proposal here is for a residential development of three apartment blocks containing a total of 64 units. Our view is that this should be judged in the same way, and consider that it should conform to the requirements of the Local Plan to provide 35% affordable accommodation. As the proposal is for luxury apartments, then (as with the Pendennis scheme) a pro-rata contribution to fund affordable housing elsewhere in Falmouth should be made. It was also noted that the emerging Neighbourhood Plan stressed that design was important (referring to the NPPF) and that schemes should follow the guidance in Building for Life (BfL) and the Cornwall Design Guide. Accordingly, the Civic Society tested the proposal against the BfL criteria of 20 questions, 13 of which were relevant to the proposal. Out of a potential score of 13 this scheme scored around 4. While in relation to environment and community the proposal added a welcome facility of a shop and café/restaurant, it did not provide an accommodation or tenure mix, had inadequate access to public transport and appeared to lack features to reduce its environmental impact. The character of the scheme succeeds in providing a specific design, distinctive character and some architectural quality, but does not fit well with existing buildings or landscape, being out of scale with its surroundings. F B R A OBJECTS to this development (PA16/08689) to reflect the views of the majority of its members - some 450 who live mostly in close proximity to this development. Recognising that a significant part of the development being planned has already been approved, the footprint of now 3 buildings (as opposed to 1) and related hotel rooms and parking spaces have been significantly modified in this new application for variation, and are only acceptable in part. 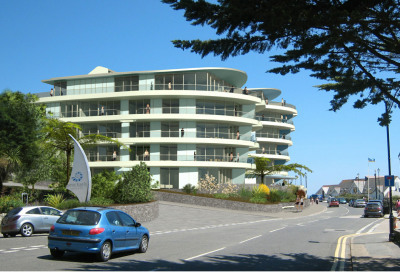 The first building planned to be built and the largest of the 3 is that at the eastern end of the site which is both too high and too close to the narrowest part of Cliff Road. Its dominance as a result will be unsightly and a mass that might render it to be an eyesore we will all regret. Moving this particular building back away from the road by some metres and raking the upper floors will make a significant difference to its visual impact. Parking spaces appear to have reduced from the originally approved application; the number of hotel beds are also reduced (ignoring the potential for apartments that might be sold and passed back to the development for management and letting). But the overriding objection is the mass of the principle building - too close to the roadway and too high; whatever relationship to the previous buildings resonance with those buildings in Stracey Road. 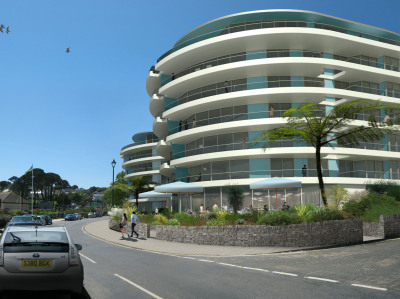 Some creative architectural changes might provide for a far better visual appearance and allow for an acceptable and much needed development on this part of our coast and enhance the attractiveness of Falmouth to the benefit of St Michael's and the rest of us. Surely the preferred objective. This planning application falls under Saved policy 11c.
" In the prime sea front Hotel area of Falmouth the conversion of Hotels and guesthouses to uses other than holiday accommodation will not be approved where they have an adverse impact on the tourist character of the area.". Malcolm Bell Visit Briton recently stated in the West Briton that Tourism is worth in excess of £1.8 Billion to the Cornish Economy. This Development is a prime seafront tourist location and as such has been deemed worthy to protect under Policy 11c. Residential apartments are proposed in this application not Tourist apartments, so for that reason alone this planning application should be refused. After The Falmouth Beach Hotel burnt down Cornwall planners insisted a Hotel be rebuilt on site! The fact that external Finance is not forthcoming should not be a factor to the detriment of Falmouth's seafront. And a great many other Falmouth residents all oppose this scheme, with their good reasons. 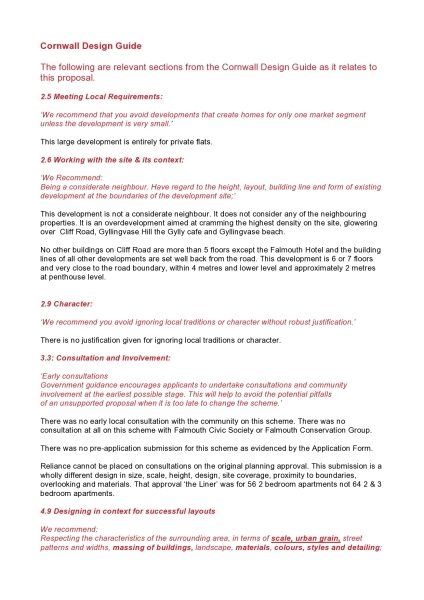 Please use the link above to comment on this planning application. View our information pages on how to register with the council and leave a comment. Let your councillors know your opinion, they can only represent you if they are advised how you feel.